This video involves a therapy session with two clients: Monde and Nick. Monde is a 32-year-old women who is married with three children. Monde has had three therapy sessions with Dr. Erickson and has been exposed to hypnosis in prior sessions. Monde is seeing Dr. Erickson because she is feeling insecure about herself as a person, mother, and wife. The other client, Nick, is a 20-year-old sophomore in college who has had no previous experience with hypnosis or psychotherapy. In addition, Nick is an acquaintance of Monde and her husband. The therapy session is conducted in two parts: part one involves Monde as the primary patient while Nick is the secondary patient and part two involves Nick as the primary patient and Monde as the secondary patient. 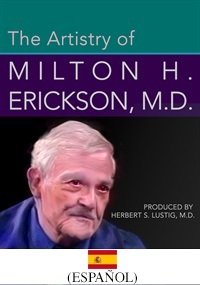 L'art (le talent artistique) de Milton H. Erickson, M.D. This recording demonstrates Dr. Erickson's innovative combination of hypnotic and psychotherapeutic techniques in English with a French transcript. Cette vidéo comporte une séance de thérapie avec deux clients: Monde et Nick. Monde est un 32 ans, les femmes qui se marient avec trois enfants. Monde a eu trois séances de thérapie avec le Dr Erickson et a été exposé à l'hypnose dans les sessions antérieures. Monde est de voir le Dr Erickson parce qu'elle est un sentiment d'insécurité sur elle-même en tant que personne, mère et épouse. This recording demonstrates Dr. Erickson's innovative combination of hypnotic and psychotherapeutic techniques in English with a Mandarin transcript. Questo video coinvolge una sessione di terapia con due clienti: Monde e Nick. Monde è una donna di 32 anni che è sposata e ha tre figli. Monde ha avuto tre sessioni di terapia con il dottor Erickson ed è stato esposto ad ipnosi nelle sessioni precedenti. Monde sta vedendo il dottor Erickson perché si sente insicuro di se stessa come persona, madre e moglie. L'altro cliente, Nick, è uno studente di 20 anni che non ha avuto esperienze precedenti con ipnosi o psicoterapia. Inoltre, Nick è un conoscente di Monde e di suo marito. La sessione di terapia è condotta in due parti: la prima parte coinvolge Monde come il paziente primario, mentre Nick è il paziente secondario e la seconda parte coinvolge Nick come il paziente primario e Monde come il paziente secondario.